OMEGALAQ™ Liquid LAQ Series uses the same material as used in OMEGAMARKER™ in lacquer suspension. Lacquer serves a transport function only. OMEGALAQ™ may be thinned to ensure workable consistency. Thinning OMEGALAQ™ will not affect its accuracy. 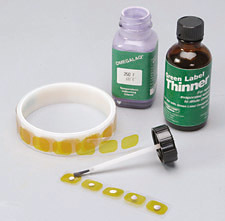 Order GREEN LABEL THINNER. To use, simply shake or stir to a uniform consistency and apply a thin smear to the working surface before heating begins. It dries almost instantly to a mark. When the stated temperature is reached on subsequent heating, this mark liquifies sharply. A melted OMEGALAQ™ coating does not revert to its original dull-opaque appearance but remains glossytransparent which makes subsequent interpretation a simple matter. Temperature Indicating Lacquer, non-hazardous, 2 oz. Temperature Indicating Thinner, non-hazardous, 1 pint.